How Can I Pre-Acclimatize to Nepal's High Altitude? Everyone can benefit from using altitude training systems to pre-acclimatize to the high altitude. 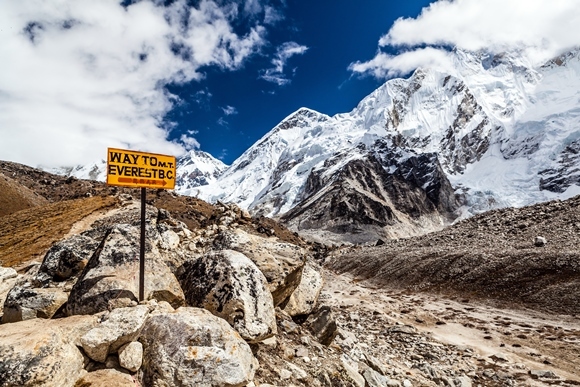 Altitude training systems work by simulating the high altitudes found in Nepal. The altitude training system reduces the percentage of oxygen in the air you breathe. Through regular use, the body undergoes physiological changes to cope with the lower oxygen level. Without pre-acclimatization, as climbers ascend in elevation, their bodies respond with short-term adaptations. These quick-response adaptations are meant primarily to prevent sickness and allow for some semblance of normal cardiovascular and muscular performance in an oxygen deprived environment. Reduce the Incidence of Acute Mountain Sickness. Acute Mountain Sickness (AMS) is one reason visitors can become ill in Nepal (See Altitude Acclimatization). Most people will experience some symptoms of AMS. Pre-acclimatization can reduce or eliminate symptoms of AMS. Increase performance on the mountain. Pre-acclimatization significantly improves the body’s mechanisms for delivering oxygen to the muscles. The result is increased aerobic and anaerobic performance on high altitude treks. Ultimate Expeditions® has partnered with AltitudeTech to offer our customers discounts on the rental or purchase of altitude training systems. AltitudeTech is the leading manufacturer of competitively priced altitude training systems. 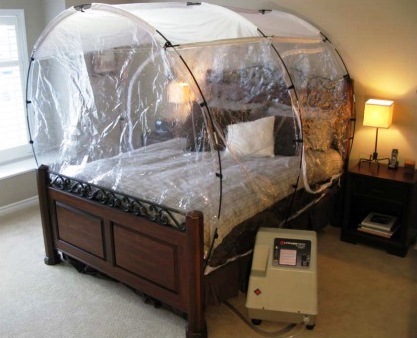 AltitudeTech’s altitude training systems allow climbers to pre-acclimatize in the comfort of their own home. The system can be used either during sleep, during rest, or during exercise. The most effective training method is pre-acclimatize while sleeping. Climbers simply sleep inside the tent overnight. The tent fits over any bed size, king or smaller. Zippered doors are on both sides of the tent for easy entry and exit. Note that the enclosure is not air tight and is not intended to be. The generator pushes air with reduced oxygen content into the tent, forcing the normal oxygenated air out of the tent. We recommend sleeping overnight for 6-8 hours at a simulated altitude of 10,500 feet for 6-8 weeks for proper pre-acclimatization for Everest Base Camp and other high altitude treks in Nepal. Clients can also pre-acclimatize while exercising by wearing an exercise mask during light workouts. To achieve benefits, it is enough to spend 30-40 minutes on a bike, elliptical or treadmill for 3-4 times a week. We recommend exercising at a simulated altitude of 10,500 feet for 6-8 weeks for proper pre-acclimatization for Nepal. These sessions are not meant to replace normal workouts, but are in addition to regular workouts in your training program. Finally, it is possible to pre-acclimatize while resting – such as while watching television, reading, or surfing the internet. Wearing the mask daily, for one hour a day, at high altitudes is required. We recommend wearing the mask at a simulated altitude of 20,000 feet for 6-8 weeks for proper pre-acclimatization for Nepal. Each method is effective in attaining acclimatization prior to arriving in Nepal. Clients do not have to engage in more than one method, but using multiple methods will yield greater results. AltitudeTech are experts in the field and will provide full instruction and support during your rental period. Increase your summit success rate, prevent AMS, and improve your performance in Nepal. Contact AltitudeTech today to begin your pre-acclimatization program. AltitudeTech ships worldwide.